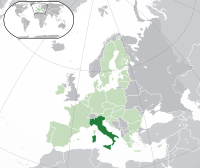 Italy (it: Italia). Musanda wa Italy ndi Rome. Henefha hu na vhadzulapo vha 60 599 936 (2016). This page was last edited on 18 July 2017, at 10:14.